Olive oil is fabulous for our skin when eaten and when applied to our skin. Both by consuming olive oil and using it on your skin (on its own or in skin care products that contain this ingredient) you can help your skin stay youthful and smooth. Known since ancient to have beauty benefits, olive oil was a common beauty ingredient for the Egyptians, Greeks, and Romans. Keep reading to find out all the skin and beauty benefits of this ingredient along with olive leaf extract. Native to Mediterranean, Asia, and Africa this evergreen shrub or tree is part of the Oleaceae plant family. Olives are the fruit of this tree, and they are harvested to be eaten and pressed to make olive oil. The leaves of the olive tree have been used to treat disease for thousands of years, and the extract is also found in skin care products. Olive oil is high in monounsaturated fatty acids especially one called oleic acid. It is also high in Vitamin E and antioxidants which help our body from the inside out and the outside in. Our skin can benefit both from the fruit of the olive tree (the olives and olive oil made from olives) and from the leaves of the tree. There are numerous skin care products that contain olive oil or you can easily make your own products. Be sure to use Extra Virgin Olive Oil when going the DIY route since this type of olive oil contains no refined oils. Just be sure to purchase from a trusted source because it has been found that not all products labeled EVOO are actually that in reality. Olive oil contains antioxidants which protect our skin from sun damage and free radical damage. These properties are also anti-aging which means olive oil can help our skin stay younger looking for longer. In addition, olive oil is also a great skin moisturizer that won't clog pores, even sensitive skin types and those with combination skin can use olive oil as a moisturizer. Olive oil can soothe eczema and treat cracked skin on heels. Hydration: Olive oil is a great skin moisturizer. You can apply just a few drops of this oil directly to your skin to hydrate and soften your skin or add a drop or two to your favorite moisturizer to boost its moisturizing benefits. You can also purchase a moisturizer that contains olive oil like Kiss My Face Olive & Aloe Fragrance Free Body Lotion or use a facial serum like Fable Naturals Nourishing All Natural Facial Oil, Olive/Rosehip to hydrate your face. 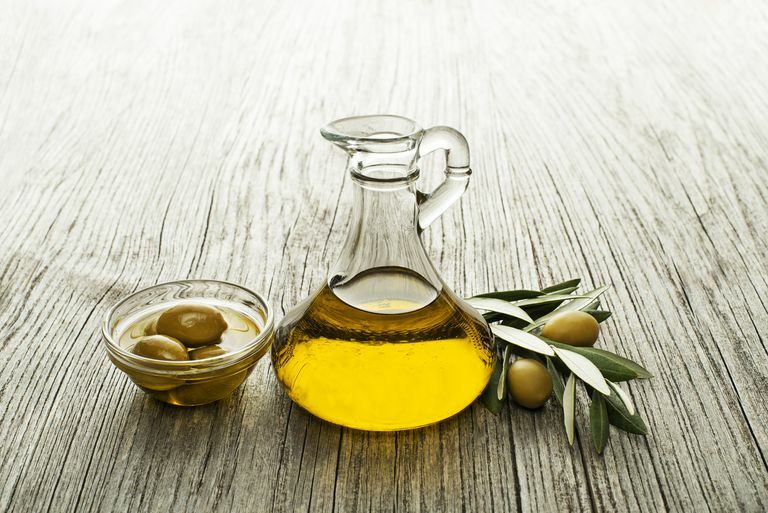 Olive oil is also a great moisturizer for nails and cuticles. Makeup Remover: Olive oil can be a cost-effective makeup remover including for your eye makeup. Put a little olive oil on a cotton pad and swipe over your face in order to remove makeup. If you don't want to use the oil directly on your face you can use a cleansing oil that contains olive oil like DHC Deep Cleansing Oil. Just be sure to wash your face after removing your makeup; this is called a double cleanse. You can even wash with a cleanser that contains olive oil like Serious Skincare First Pressed Olive Oil Emulsifying Cleanser. Use as a Body and Lip Scrub: If you like to make your own skin care products you definitely need to try making some with olive oil. Mix olive oil with sugar or salt to make a scrub that can be used on your body (but not your face) and your lips. Not only will you remove dead skin cells and reveal plump new skin cells, you will also get excellent skin moisturizing properties at the same time from the olive oil. Use Olive Leaf Extract to Cleanse and Moisturize Your Skin: Skin cleansers that combine olive oil and olive leaf extract help not only to gently cleanse your skin but are also moisturizing and anti-aging at the same time. Look for olive leaf extract in Thymes Bar Soap, Olive Leaf or in Thymes Body Lotion, Olive Leaf.